Will the U.S. Ever Abolish the Death Penalty? Examination of the death penalty in the U.S., is percolating (let’s hope it’s more like fomenting) to the surface again as the Boston jury voted on May 15 to execute Boston Marathon bomber Dzhokhar Tsarnaev. Disagreeing with the verdict, more than 60% of Boston residence believe he should have been sentenced to life in prison instead. At age 21, he will be the youngest person on federal death row. There’s no question that the bombing was horrific and despicable. But how is murder for murder justifiable? 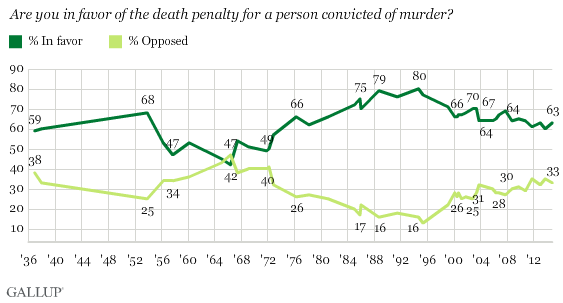 Over the decades, the needle has moved very little on how Americans feel about sentencing convicted criminals to death. Yet the international community, with a few notable exceptions, is increasingly embracing abolition of the death penalty. As the Map: How the world executed people in 2014 shows, the U.S. is in dubious – and downright frightful – company. Why is it that U.S. public opinion so far behind our international neighbors? Alba Morales (@albaHRW) wrote for HumanRightsWatch.org: “At last Monday’s Universal Periodic Review, a process through which each United Nations member country has its human rights record periodically reviewed by other member countries, 36 countries called for the US to reconsider its use of capital punishment. 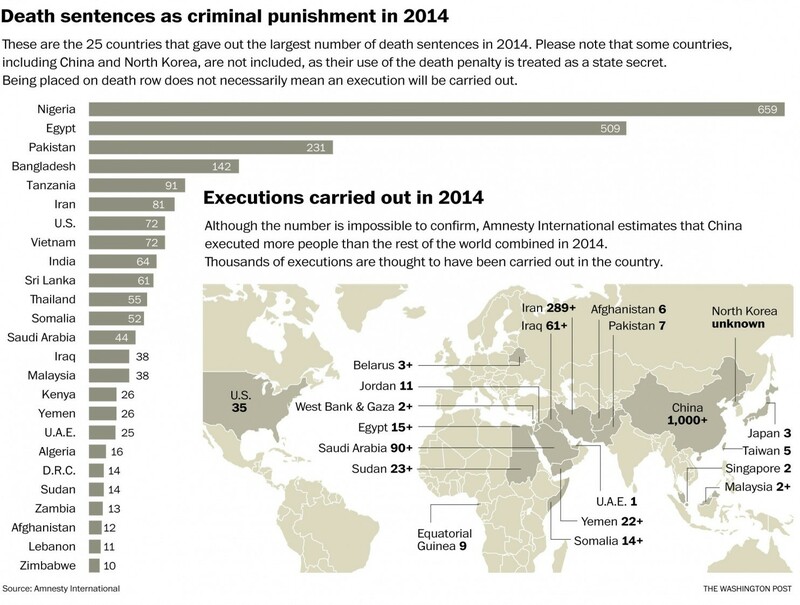 The US, a country that carried out among the greatest number of executions in 2014, is one of a dwindling number of countries that use the death penalty.” The U.S. delegation responded (and I’m paraphrasing), “No federal defendant has been killed in the last decade.” Of course, only 18 states and the District of Columbia have abolished the death penalty (Maine, Michigan and Wisconsin abolished it before the turn of the 19th century; Connecticut is the most recent, abolishing it in 2012). Oregon is one of the states with the death penalty, though Governor Kate Brown extended former Governor John Kitzhaber’s ban on executions. What and how long will it take for the U.S. to abolish the death penalty? Let us know if your opinion about capital punishment has changed? Are we hearing the truth about San Bernadio shootings?